Sculptor Steven Woodward’s studio lies out in the country of Ellison Bay, tucked in the woods, at the northern end of the peninsula. A native Minnesotan, Woodward has been working in Door County for the past ten years. 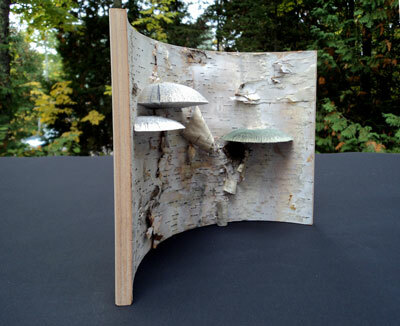 Woodward’s artwork has been shown all over the United States, a majority in his home state of Minnesota. 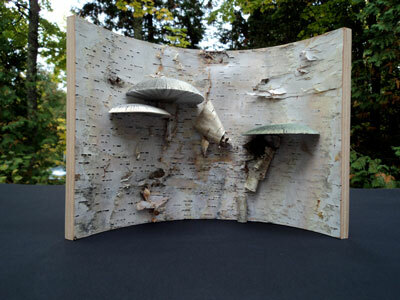 His sculptures are most often created out of wood, but he also uses bark, flags, rag rugs and even dictionaries. 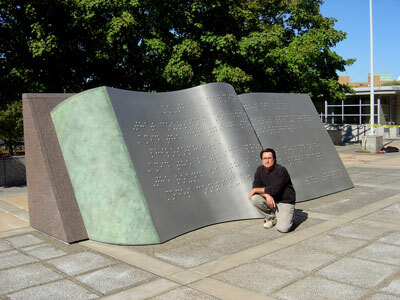 His notable work — Silent Laws was commissioned by The St. Paul Companies, Inc. is a stainless steel, bronze, and granite featuring the a poem by Walt Whitman in braile — is currently featured in the Sister Bay-Liberty Grove library along the back wall past the computer and fireplace seating area and behind the shelves, and a small braile representation is available at the circulation desk as well. 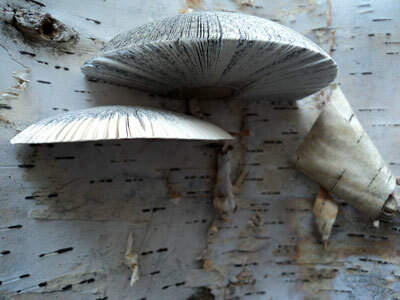 Woodward has also been working on a project in conjunction with the Sister Bay/Liberty Grove Library, constructing wooden books made out of recycled wood and birch bark and has attached little mushrooms made out of pages from a dictionary. They will be displayed in the vitrine on entering the building, and he hopes they will be able to teach children in more than just an illustrative way, but it a sculpted way, he said. His display should be ready for viewing in August, along with some storyboards detailing some of his past works in late June. Woodward found his voice through art, and his hope is viewers will hear it when seeing his sculptures. 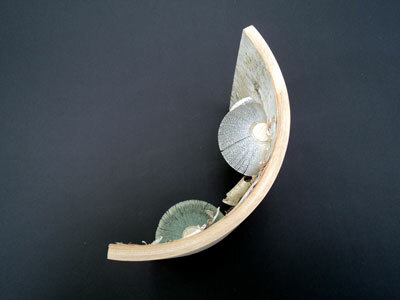 Come in and see his work, and join us for his Artist's Talk this evening at 5:30 p.m.